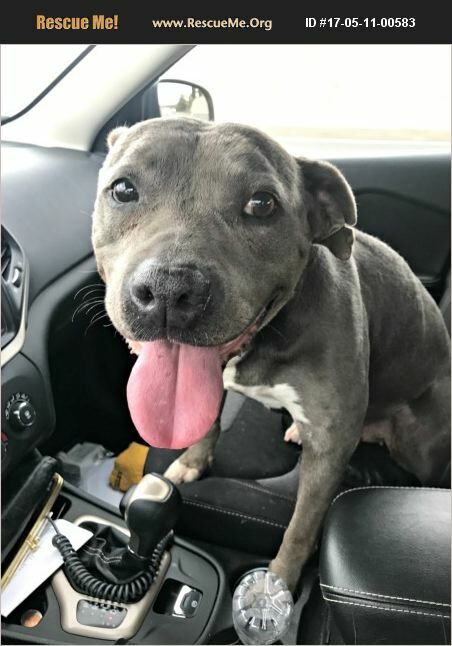 Maddie is a sweet 5-year-old Blue Nose Staffie Mix. She had been stuck at the San Bernardino Shelter for the last 5 months. We heard about her through Saving San Bernardino Pups and knew we had to break her out of there. So we did and sent her straight to the vet. It turns out the poor baby had a benign tumor removed and was treated for an ear infection. This little Blue Nugget of love weighs in at 50 pounds and can stand to gain another 5 pounds. She loves to go on walks. She literally just came from the shelter and it is amazing how well she does with leash walking, taking treats and taking in all of the love and kisses she can get. Maddie does seem protective of her food so it will be important to feed her separately from other pets. We also recommend a slow introduction if there are other animals in the household. She is a curious dog who loves to explore and look for lizards and other fun creatures. She rides nicely in the car as well. Maddie does great with children and adults. We have not had her with small children so again we always like to encourage a calm and slow introduction. Maddie is a great and loving dog who has just had some bad luck. We would like to find her a forever home in a calm environment with lots of love, playtime, and affections. She will make a great addition to any family.